Samsung Galaxy S4 is a real good smartphone, we agree with that, but Samsung, the maker of the device is busy in promoting the phone which could have been a lot better but they have messed it up in India with the Gangnam Style’s lyrics changed, to the worst! Yes Samsung, you have failed with the marketing. Update: It’s not Samsung’s fault totally, because its originally Reliance who had organized this event, to show the collaboration between the two brands, and in the end, it came out in this way. Reliance should have had better ideas, but they ended up with this one and Samsung approved it. In the launch that was happening all around the world, India was a place where Samsung took it in other way and the marketing team might have thought that this idea of having Ranveer Singh in the video dancing with a weird lyrics would look cool. The lyrics takes away everything, and the dance would have looked a bit better if Psy’s permission would have been taken to just dance to his original song. The lyrics includes everything about the phone, but it shows utter desperation that Samsung wanted to show what all is included, but they didn’t have any other way to show that off, so just write out a song without actually thinking whether it would look good or not. Aage bhi camera, peeche bhi camera.. dual shot, drama shot..
And finally, S4 Samsung Style.. with the ugly looking dance steps. Psy would certainly be disappointed at the performance here. 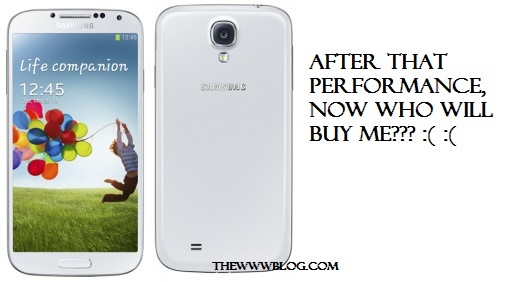 The Samsung Galaxy S4 launch in India didn’t surprise the buyers as the pricing of Rs. 41500 was expected, and a little higher pricing too wouldn’t have surprised anyone, but the launch should have been really better than this.